Hairspray is a cosmetic product designed to hold hair in place. There are many different brands and formulations available, each containing a different blend of ingredients. 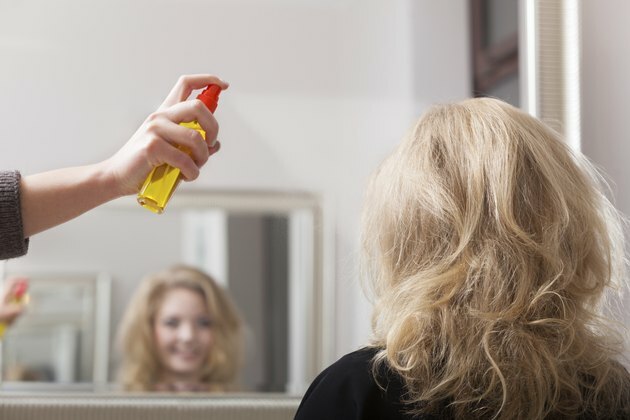 While more research is needed on the health effects of hairspray, certain ingredients have been linked to adverse health effects in some instances. Hairspray contains a group of active ingredients -- polymers and solvents -- in addition to one or more propellants. It usually comes in a container with a pump or aerosol nozzle. Polymers are responsible for hairspray's glue-like effects, while solvents are used to dissolve the ingredients into a solution. Common polymers in hairspray include polyvinylpyrrolidone (PVP), vegetable gums and gum arabic, while alcohol and hydrocarbons make up the solvent portion. Other ingredients, such as propylene glycol, isobutane, propane and fragrance, may also be present. Before the 1970s, hairspray contained the chemical vinyl chloride, which served as a propellant in aerosol cans. According to the National Institutes of Health, vinyl chloride is a known carcinogen linked to angiosarcoma of the liver in humans. Even more troubling is that manufacturers were aware of vinyl chloride's toxic effects for nearly a decade before removing it from the market. The propellant that replaced vinyl chloride—methylene chloride—was later recalled due to similar carcinogenic effects. According to the PBS website, it is not known whether ingredients currently used in hairspray are safe for human use. While hairsprays no longer contain vinyl chloride or methylene chloride, ingredients in many formulations may still cause adverse health effects in susceptible individuals. According to the Centers for Disease Control, it is not known whether propylene glycol--a common hairspray ingredient--has cancer-causing properties. Most hairsprays contain a group of ingredients referred to simply as "fragrance." Because the specific ingredients are not listed on the label, it is impossible to accurately assess their safety. While the chronic health implications of hairspray ingredients are somewhat controversial, its more immediate dangers are better understood. Hairsprays can cause fire and personal injury when exposed to open flame and should be kept away from direct heat sources. According to Drug Information Online, inhalation of denatured alcohol, hydrofluorocarbons and other hairspray ingredients can lead to acute poisoning, which is marked by symptoms like low blood pressure, breathing difficulty and coma. Irritation of the skin, eyes or lungs may also occur in sensitive individuals. Trade secret laws protect manufacturers who choose not to disclose all of the specific ingredients on the labels of cosmetics, making accurate safety assessments impossible in some instances. Factors that may influence the health risks of hairspray include length and frequency of exposure, personal health history and other unknown variables. National Institutes of Health: Vinyl Chloride Propellant in Hair Spray and Angiosarcoma of the Liver Among Hairdressers and Barbers: Case Reports.